Coach Hire is one of cheapest forms of moving multiple numbers of passengers throughout the UK, we can provide coaches on a regular basis for contract work, for schools and business alike. 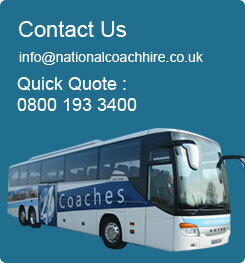 Generally the hire of a coach for a prolonged period of time on a contract has its own benefits for our clients, heavily discounted rates due to continuous work flow, a local based company that will have more than just one coach on its fleet thus enabling replacement vehicles should there be a breakdown at any time, a great rapport with the driver or drivers. A lot of coach companies are happy to provide a coach and driver and this is where their service stops, at National Coach Hire we put a huge emphasis on customer satisfaction and are always looking at ways to improve the service we provide to you, from answering your call to the delivery of booking confirmations right through to how the driver greets you upon his arrival. Contact us today to discuss your forthcoming coach hire requirements and experience what it feels like to have the full service.